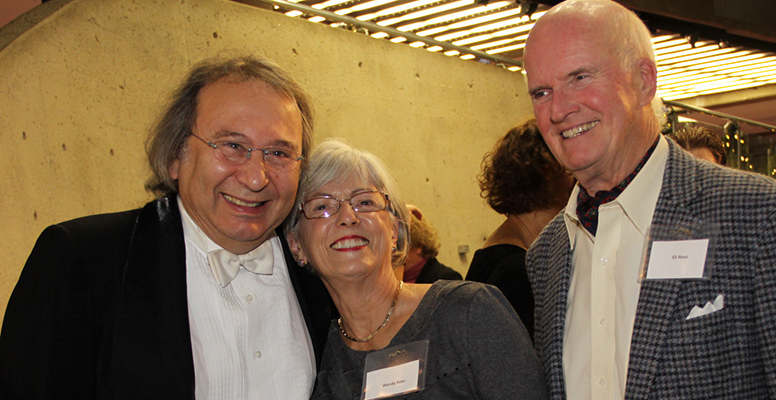 Wendy and Eli Rees enjoy a cozy moment with Assistant Principal Cello, Shimon Walt, at a post-concert reception. Wendy has volunteered on the Musical Chair Committee for five years, chairing it for the past three. She recently shared her thoughts on why it has become so popular with Symphony supporters. “As a committee, we try to get the message out to as many Symphony Nova Scotia supporters as possible. The Musical Chair program is an added bonus to give them a personal connection to the orchestra. We talk to people that we really feel would be interested in that connection. Musical Chair donors are given a number of opportunities throughout the season to meet and get to know the musicians. There are regularly scheduled post- concert receptions and access to some of the work behind the scenes at rehearsals. “Eli and I had already known Shimon for many years when we joined the Musical Chair program. Since then, we have met a lot more of the musicians and gotten to know them on a first name basis. I remember when Kerry and Dominic first joined the orchestra. It was nice to be able to welcome them to the Symphony and to Halifax and we really enjoyed getting to know them over the years. Wendy is also a big fan of the onstage passes. Musical Chair donors participate for many reasons, but for Wendy the ultimate reward is evident at every performance. Wendy has dedicated years of time and energy to the program and has enjoyed being a part of its evolution. Wendy invites donors to consider joining now. For more information on Musical Chairs contact Anne Laybolt, Director of Development. 902.421.1539 or by email development@symphonyns.ca.